Supercharger Pulley Puller This cost-effective supercharger pulley puller will help you get your 02-06 R53 MINI Cooper S and 05-08 R53 MINI Cooper S Convertible supercharger pulley off faster. With this tool, you will be able to remove the stock press fit supercharger pulley safely, without removing the belt tensioner. Time is money and this supercharger pulley puller will save you both. The pulley puller body is made of heat treated carbon steel and has a tooth profile to match the OEM pulley exactly. The center screw is grade 8 quality. 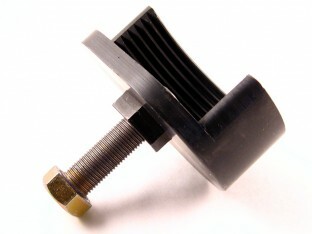 This tool can be rented for free with purchase of our WMW supercharger pulley.